Congratulations to all our 2018 memorial scholarship and teaching assistantship winners! The scholarships provide full tuition for the 2019 music school and recognize outstanding musicianship, grit and joy in learning old time music. And we look forward to Arlo and Cheyenne helping teach classes next year! 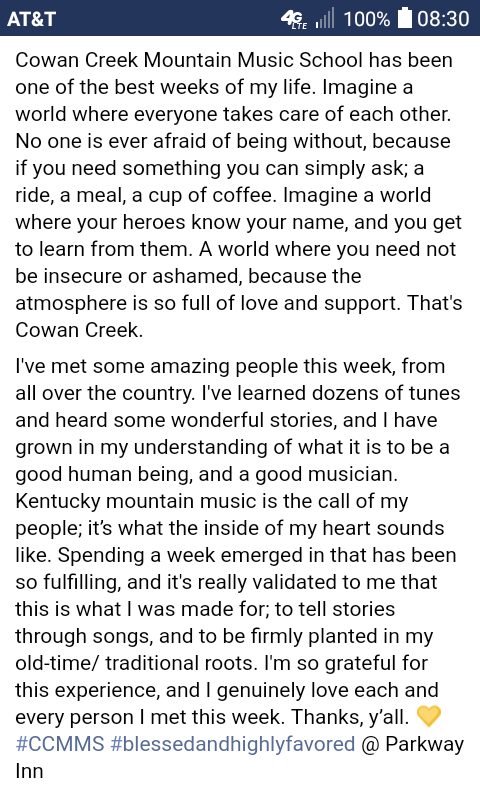 Finally, check out Larah’s post below- she caputred what’s in all our hearts after a week on Big Cowan. Thanks so much Larah! 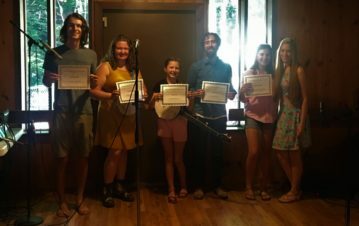 Ray Slone Teaching Assistantship: Arlo Barnette, age 23, guitarist from Bath Co., Ky.
Rodney Sanders Scholarship: Larah Helayne, age 16, songwriter, Montgomery Co., Ky.
Burt Hatfield Scholarship: Nora Brown, age 12, banjoist and singer from Brooklyn, NY. Art Stamper Scholarship: Derek Harris, fiddler from Louisville, Ky.
JP Fraley Scholarship: Lily B. Smith, age 13, fiddler from Clay County, Ky.
Paul David Smith Teaching Assistantship: Cheyenne Mize, fiddler from Crestwood, Ky.
Arnold “Cowboy” Martin Scholarship: Ariana Velasquez of Pike County, Ky.